Construction is underway on a downtown Great Bend plaza that will honor microchip inventor Jack Kilby, who grew up in Great Bend. The plaza is being built on the west side of the Barton County courthouse square, which also bears Kilby’s name. Funding for the Kilby plaza, which includes a bronze sculpture memorial, has mostly been secured, much of it by an anonymous donor. However, there is now opportunity for community members to commit their names to the project, literally. 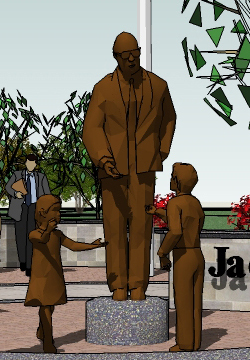 The Jack Kilby Memorial Committee is providing funding opportunities for community members and businesses to purchase donor bricks and signage to be placed throughout the plaza, which locally honors the accomplishments and the memory the hometown inventor who went on to change the world. Kilby’s invention of the monolithic integrated circuit – the microchip – laid the conceptual and technical foundation for the entire field of modern microelectronics. Kilby wasn’t born in Great Bend, but he spent his most formative years in the community and developed his inquisitive mind, attending Great Bend High School and becoming an Eagle Scout. Late in his life, on a return visit to his hometown nine years ago, Kilby attributed his monumental achievements to the education and experiences he gained growing up in Great Bend. Much of the young electronics-tinkerer’s inventive inspiration took hold in the basement of his parents’ home on the northwest corner of Washington and Forest. His Great Bend experiences served as the building block for Kilby’s remarkable journey, which led to his world-changing invention of the integrate circuit in 1958, while he worked for Texas Instruments. As a way to involve the community in honoring and memorializing the humble, soft-spoken inventor and engineer, who died in summer 2005, the memorial committee is offering donation bricks for a minimum amount of $200. The bricks will include laser-etched names of contributors. Larger donations will be recognized with prominent plaques throughout the plaza. Work by Eby Construction Company Inc., Wichita, is now underway to construct the plaza, which has been in the planning stages for more than six years. The construction company is working from plans drawn up by PBA Architects, Wichita, along with lighting architect, Gary Gordon LLC, New York City. Local artist Chet Cale is working on the Kilby memorial exhibit and will sculpt and cast the bronze work, named “The Gift,” but that won’t be completed for many more months. “The Gift” portrays Kilby giving his microchip to a young boy, while a younger girl reaches her hand toward the boy and points to the stars with her other hand. Symbolically, the exhibit represents transmission of knowledge from one generation to the next and how that transmission has been affected by the microchip. Those wanting to participate in naming opportunities are encouraged to call Opie, 620-793-5455, or e-mail him, glennopie@ruraltel.net. Donors can mail checks to Great Bend Foundation, PO Drawer E, Great Bend, KS 67530. Donations are tax deductible and no tax dollars are going toward the project.